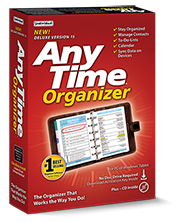 Make AnyTime Organizer the center of your life and you'll see why more people choose AnyTime over any other brand of organizer software. 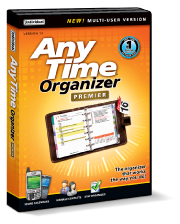 Choose the Best AnyTime Organizer Software for You! Get organized and take control of your life! Color code different areas of your life—work, personal, other—then view your appointments, contacts, to-dos, and more for those areas separately or at the same time. 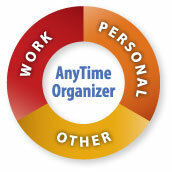 Individuals using the AnyTime Organizer Deluxe for single-users can organize both their personal and professional life, while small offices and work groups using AnyTime Organizer Premier network license for multi-users can organize multiple schedules, tasks and projects and stay in sync with the entire office. Calendar — Organize your calendar for work, personal, or other groups and filter to view one at a time. Schedule events, calls, tasks and appointments, and avoid conflicts. View your schedule and appointments by day, week, month, and year. Add recurring events and meetings. Create a PDF of any layout and e-mail your schedule to others. Organize one or multiple calendars all in one place. Day Planner with user-friendly interface. To-Do Lists — Increase your productivity and get ahead. Prioritize and manage your To-Do lists, and accomplish tasks on time. Choose from a number of To-Do layouts to suit your work style. Print and check accomplishments as you go. Check off To-Dos as completed. Record all of the things you have done. Set deadlines or track untimed To-Dos. Prioritize and sub-prioritize your To-Dos. Categorize your To-Dos by assigning to different groups. Prioritize your To-Dos and complete more tasks. 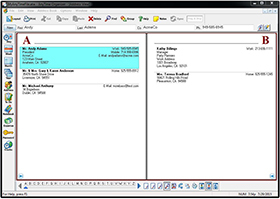 Address Book & Contacts — Keep a detailed record of every contact. 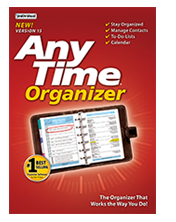 AnyTime Organizer offers you the easiest way to stay organized and in touch with the important people in your business and personal life. Keep a history of meetings, tasks, and notes. Simply drag-and-drop to schedule calls. Date and time stamps are added automatically. Add photos for each person as a quick visual. 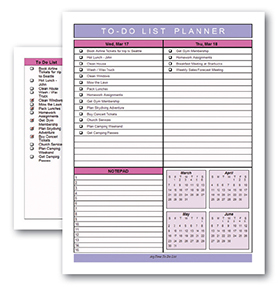 Keep track of birthdays, anniversaries, and special events for all of your contacts. Organize your address book and stay connected. Consumer software (Personal Organizer) are licensed for one person. Multi-user, licensed products (for Small Offices & Work Groups) are uniquely designed for use in an office setting where two or more people use the software. As a busy mom, AnyTime helps me stay on top of my kids' sports schedules, school assignments, chores, meals, and doctor appointments. We schedule everything-court appearances, depositions, and client meetings. I have a separate to-do list for each case and have never missed a filing deadline. ...an excellent tool for small businesses...to schedule meetings for busy people whose individual schedules are all over the place. AnyTime is a colorful organizer that combines the familiarity of paper tools with the ease of computers.